Paw Print Genetics - Have You Connected With Us On Facebook? 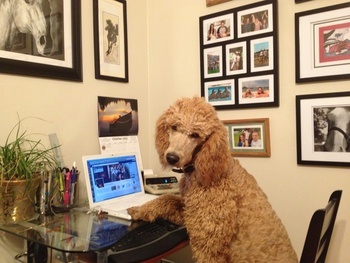 Social media has been a very successful avenue for Paw Print Genetics to reach our customers. We have connected with fans all over the United States, Canada, the United Kingdom and even Australia! Dog lovers all over the world understand the importance of optimal canine genetic health and are choosing Paw Print Genetics for their testing needs. One of the most valuable reasons to connect with us via Facebook is for our special discounts and promotions. Each month has a theme for our Breed of the Week posts which discuss the breeds history, health, temperament, and includes a special discount on testing. We also post any show discounts or current promotions for you to use at checkout. Our Facebook fans and newsletter recipients are the first to know when new disease tests are released. On our website we have a wide selection of blogs and our Facebook fans are the first to read them. Several authors write informative articles that explain genetic diseases, canine safety tips, breed of the week profiles, and developments within our lab and in the canine health world. Facebook is a great way to connect with friends and others who share the same passion about breeding healthy dogs. We encourage you to share our information and discounts within your online groups, breed clubs, and canine networks. We truly appreciate the posts on our wall about your positive experiences and the recommendations to others who are considering testing with us. Referrals from our loyal customers are very important to new customers. If you are not a fan of our page please visit https://www.facebook.com/PawPrintGenetics and like it! Paw Print Genetics™ is dedicated to achieving optimal canine genetic health by providing outstanding resources for dog owners, breeders, trainers, veterinarians and researchers for pets, show dogs and working dogs.